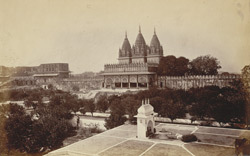 Photograph of a temple at Datia in Madhya Pradesh from the Album of 'Views of Central India by Deen Dayal, Indore', taken by Deen Dayal in the 1870s. Datia is an ancient town already mentioned in the Mahabharatha as "Daityavakra". The town is a pilgrimage centre for the devotees of Siddhapeeth Shri Peetambara Devi. Among the many temples are a temple with Mughal style frescoes and the Gopeshwar Temple. The principal monument is the seven-storeyed palace of Raja Bir Singh Ju Deo, built on a hill overlooking a lake.